This is one of the best holidays for people who don't want to spend their whole day on the bike but instead enjoy a few hours riding between different towns and through the countryside. Rides are flat and on traffic-free roads, making this a completely accessible trip. Burgundy is one of the most scenic and vibrant places to cycle in France. 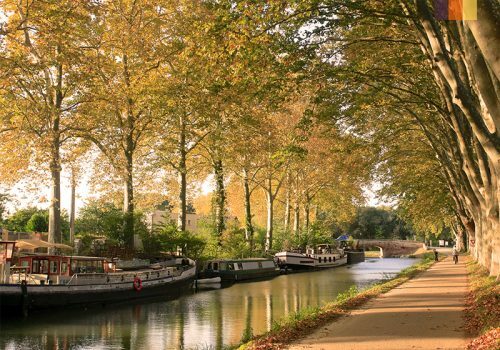 Your cycle paths weave in and out of the vibrant vineyards before leading you on to yet another picturesque French town. This is the ultimate relaxation and exploration holiday. As one of the most famous wine regions in France, this is a trip for lovers of both dry reds and Chardonnays. Taste the local grapes and notice the variations depending on location and explore vineyards dating back to medieval times. Lyon is the closest large airport although the Eurostar or flying into Paris is an option for arrival into the Burgundy region. Depending on when you arrive, we recommend finding the time to walk up to the ruins of the Château of Saint-Romain. From here, the views across the valley are truly spectacular and introduce you to Burgundy in the perfect way. We also suggest visiting the ‘Tonnerie François Frères’ where wine barrels are made and distributed all over the world. Today’s ride is a circular one through the Côte de Beaune. Visit old mansions, ride through vast vineyards and across undulating fields. You will visit a number of villages and towns from the more commonly known Meursault and Chassagne-Montrachet to the hidden gems of Chaudenay and Corcelles-Les-Arts. A beautiful ride for the first day on the bike and the perfect introduction to the wine region. Today you will only ride 22km giving plenty of time to explore the different destinations on the way. Begin the day with a ride to Beaune, the wine capital of the Côte d’Or, rumoured to have been founded by Julius Ceasar in 52 B.C. Following a delicious lunch, enjoy a walk round Beaune and discover the hidden Gothic secrets that sit within the intricate architecture. Before you conclude your day in Aloxe-Corton, you will jump back on the bike and ride through fields of sunflowers, wheat and corn. Aloxe-Corton, like a number of its neighbouring villages, is celebrated for its unique wine and holds a Grand Cru status. Today will be a slightly longer day on the bike and is made up of relaxing riding and peaceful countryside landscapes. Ride past historic castles and stop by the traditional farming villages of ‘La Bourgogne’. From Chorey-lès-Beaune, ride through to the Côte-de-Nuits region and stop for a break and a bite to eat in one of the quiet farm villages. Today is a great day to explore on your own and spend time in the places you feel most suit you. Return to Aloxe-Corton where you’ll spend the night. You will come across a couple of small climbs today but these are separated by smooth country lanes, sleepy villages and oak forests. The climbs will be rewarded with incredible views over the vineyards whilst the quaint villages of Comblanchien, Buits-St-Georges and others will, without doubt, form some of the highlights of your trip. Another scenic ride lays ahead through the 17th Century mansions of Chouchey and the castle of Brochon. Here, the 19th-century poet, Stephen Liégeard lived. You will join onto a slightly busier road today for short periods of your ride but the majority of the route will return you to country lanes. hoose to take advantage of our transfer service (on request) or make your own way back to the train station in Beaune for your onward journey. If you have any adjustments to make at the end of your trip or if you wish to extend your stay, just let our cycling experience team know. The days get longer and the temperature gradually rises to around 20°C. You will experience misty mornings which will soon turn into pleasant days. There will be the odd days of rain but rarely for long periods and there are very few tourists at this time of year. Summers usually bring long dry spells. Average daily temperatures are around 24°C although mid-July can be hotter. Temperatures begin to cool and days can be cool and crisp. The watery sun gets lower and you will experience beautiful autumnal days. Winters are cold in central France. Rain is also significantly more likely at this time of year so it is not a popular time to travel. 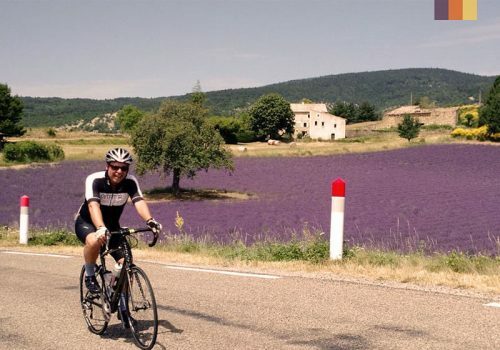 Cycle in the heart of Burgundy’s wine region to enjoy beautiful weather and an array of colours and landscapes that constantly change with the seasons. The vibrant countryside and expanse of vineyards are ideal for relaxing rides whilst the pastel coloured towns and historical landmarks break up your rides perfectly. With incredible food on offer and delicious wines to taste, this the perfect mix of cycling, cultural exposure and relaxation. We have selected the best accommodations for you based on their location, services and atmosphere they provide. We have chosen 2/3* hotels or B&'B's and all rooms have private en-suite facilities. If you wish to upgrade your accommodation, just let our cycling experience team know. Your trip will be bed and breakfast but we can upgrade you to half board if you prefer. Please just let our cycling experience team know when you enquire. The holiday is a self-guided holiday allowing you to explore France at your own pace. We have hard copy routes available for you to follow but we recommend hiring a GPS and be guided from place to place with our preloaded routes. if you require more information about your ride prior to departure and a breakdown of the places to visit along the way, don't hesitate to get in contact with our cycling experience team. We are able to provide you with a number of alternatives for your bike hire. Choose from touring or hybrid bikes, e-bikes or road bikes including full carbon options. This means you can easily travel with family and friends regardless of each members' cycling experience. Your bags will be collected each morning and taken from your accommodation to the next night’s accommodation. We suggest you keep a day bag with you for all your essentials. You will want to know that your bike is in great condition and that you won’t have any mechanical problems during your ride. Our bikes are extremely well serviced and maintained but in the very unlikely event there is a mechanical issue with the bike (not including basic maintenance such as slipped chains or punctures), we will provide you with an emergency number for someone to come out and repair or replace your bike.